Reception to Follow. Public Cordially invited. identification of the remains in Tomb II as those of Philip II stirred the Greek national imagination. Almost immediately, however, the identification was challenged (one author has even argued that the remains are those of Alexander the Great) and some doubts have been expressed as to whether Vergina is really the ancient Makedonian capital of Aigeai. In the light of continuing hypotheses and analyses, this lecture will take stock of what we can and cannot know and offer a new conjecture, as well as seeking to explain what is at stake in the identification of the burials. Service Professor in the Humanities, Professor of Greek History in the Departments of History and Classics and the College, and Departmental Chair. 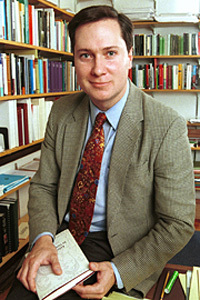 He is the author of Ethnic Identity in Greek Antiquity(Cambridge, 1997), for which he was awarded the APA’s Goodwin Award in 1999, Hellenicity: Between Ethnicity and Culture, (University of Chicago Press, 2002), which received the 2004 Gordon J. Laing Prize from the University of Chicago Press, and A History of the Archaic Greek World, ca. 1200-479 BCE (Blackwell, 2007), and has written numerous articles and reviews on the social and cultural history of archaic and classical Greece. His teaching is focused on Greek history, historiography, and archaeology. He was a recipient of the Quantrell Teaching Award in 2009.